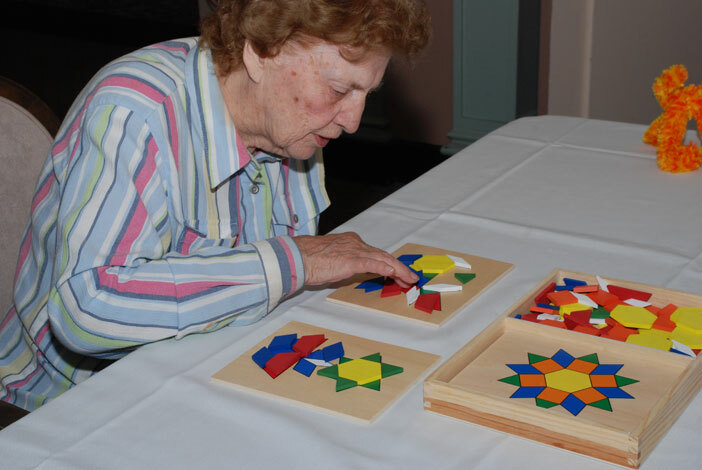 Find Activities for Alzheimer's Disease and Dementia of All Types. Appropriate activities for Alzheimer’s are so important because inactivity is so detrimental. We subscribe to a very liberal definition of “activity”. This is especially true when considering activities for Alzheimer’s disease, and dementia in general. Anything that keeps a person interested, busy, or in any way engaged, physically or cognitively, can be beneficial, and can be rightly called an activity. If she is not in some way engaged, she will fall prey to the “four a’s of Alzheimer’s”: anxiety, aggression, agitation, apathy. Then she will become difficult and unpleasant to be around. Your job will be harder, and her quality of life will be compromised. If is very important that an activity be stage-appropriate; somewhat less important that it be age-appropriate. Activities should be both age- and stage-appropriate. There is a growing body of research designed to investigate the benefit of activities for Alzheimer’s. This research overwhelmingly concludes that appropriate activities have a positive effect on the behavioral symptoms associated with Alzheimer’s disease. As the disease progresses, activities that a person has been doing all of their adult life will become too difficult. Those activities have to be modified, or new activities found. Beyond moderating behavioral symptoms, recent evidence indicates that activity and the associated sensory stimulation can actually create new connections to lost memories. Read about this exiting new research here. 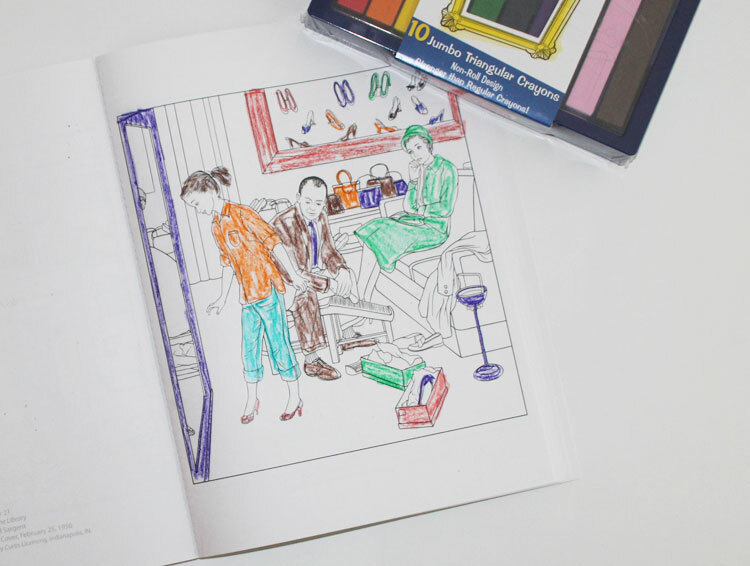 Holly brought Bernice an adult coloring book. It was at a time when Bernice was beginning to lose her small motor control. Perfectionist that she was, Bernice didn’t feel comfortable doing the coloring, so Holly put it aside, and they visited. A little while later Holly opened the book and started coloring. Soon she asked Bernice, “What color should we make that?” Bernice was happy to offer her opinion. They continued with this cooperative effort, and when the page was complete, Bernice was as proud of it as if she had done it all herself! Choosing an activity for someone who has dementia isn’t so different from choosing an activity for anyone. Consider the individual’s interests and abilities. Perhaps he or she was an avid reader but can no longer enjoy a novel or even the newspaper. Picture books with limited text are available. Someone who always kept a garden will likely enjoy helping in the garden or yard, or even keeping some plants in a pot garden. One important consideration is to make the activity no-fail. Never judge (other than to appreciate the process and result). When choosing activities for Alzheimer’s look for things that stimulate one or more of the senses. Recent research has determined that appropriate sensory stimulation creates and strengthens connections in the brain. It may even be responsible for creating new brain cells. Read more about sensory stimulation here. Suggest activities, don’t mandate them. Present a puzzle as something your care-receiver might like to do with you. Don’t say, “Today we’re going to do this,” or even, “Doesn’t this look like fun?” You’re likely to get a boisterous, “NO”. A doll makes a terrific activity for many people with dementia, and it provides a good example of how to present an activity. We strongly suggest that a doll not be given to anyone. Instead, leave the doll sitting on a chair where it will be found easily. This method allows the individual to make the choice to care for the doll rather than feeling the responsibility is being forced upon her. We recommend a similar tactic whenever introducing a new activity. Make it available but let the person in your care choose to participate, and how to participate. An activity doesn’t require something to be manipulated. activities for Alzheimer’s can be passive; sitting around a table and talking about old times, or talking about what is going on at the moment. Avoid talking about things in the recent past or plans for the future. Alzheimer’s disease first affects that part of the brain that turns experience into memory, so the person with Alzheimer’s disease will likely have no memory of recent events, but old memories are stored in a part of the brain that is affected much later in the disease’s progression. We like to say, “Make your conversations about yesteryear, not yesterday.” Your interaction then becomes Reminiscence Therapy, another activity with proven benefit to those with dementia. The part of the brain responsible for logical thought and planning also deteriorates fairly early in the progression, making conversations about future events difficult and frustrating. Too often during visits in memory care communities we have overheard conversations containing questions like, “What are you going to do tomorrow?” or “What did you have for lunch?” Such questions are invariably confusing and frustrating. Activity is important because it stimulates. Depending on the activity, the brain is stimulated, the muscles and circulatory system are stimulated, the senses and imagination are stimulated. In selecting activities for an individual with dementia, find things you think will pique his interest. It helps to know a little about the person; his history, his interests. If the person you are providing activity for is a family member, that should be easy. If you are a professional caregiver, working in a community setting or making home visits, you may have to do a little homework. The individual you are providing care for will likely not be able to tell you much about himself initially, so, whenever possible, talk to his family and his friends — anyone who knew him when he was younger. As you get to know him, you will find that he will reveal things about himself; perhaps as you “reminisce” with him or as something otherwise stimulates a memory. Music is a terrific therapy for anyone. For most of us, music is a good trigger for reminiscing. An “oldie” on the radio has the power to transport us immediately back to a high school dance (remember sock-hops? ), a first date (remember… of course you do), or a particularly memorable vacation. A funny thing about music is that it usually stirs up good memories, memories of happy times. There are exceptions, but this peculiarity is what makes reminiscence therapy such a good tool for us as caregivers to keep in our back pocket. Very often, an individual in the later stages of Alzheimer’s disease who is non-verbal and seemingly unresponsive will break into song, while listening to a familiar old standard. Often, that person will get all the words right as well as the tune. More importantly, her eyes will open; she will smile, and her whole being will be rejuvenated. If you are fortunate to ever witness such a music-inspired “resurrection” I promise you it will not only make your day; as a caregiver it will make your month! Maybe even your year!! You can see a video of just such a remarkable transformation on our music therapy page. One of our jobs as caregiver for a person with dementia is to be creative, innovative, and resourceful. Activity can be found everywhere. What we often consider to be chores can be beneficial and enjoyable activities. Activities like sorting socks, folding towels and drying and putting away the silverware not only provide stimulation but make a person feel he is contributing. Activity that provides a sense of purpose is some of the best activity. Almost any activity can be modified from one that is not an age- and stage-appropriate activity for Alzheimer’s disease to one that is. Washing, drying, and folding the laundry will eventually become folding laundry and putting it away, which then becomes folding the towels, etc. Keeping the people in your care active will improve their quality of life and will also make your job easier and more rewarding. It is very important to keep activities stage-appropriate, or the activity is likely to become frustrating, defeating the purpose altogether. Age-appropriateness is the qualifier that often goes with stage-appropriateness, but it’s a little trickier to qualify an activity as age-appropriate. A stage-appropriate activity is one that an individual is able to do. When a 500 piece puzzle becomes too difficult to complete, that puzzle is no longer appropriate for the stage of Alzheimer’s disease that person has reached. A 100 or 50 piece puzzle becomes more appropriate, and can provide the same amount and quality of stimulation. An age-appropriate activity is one that is designed to meets the needs and appeal to the sensibilities of a person who has attained a certain level of maturity, a level that is tied closely to chronological age. With Alzheimer’s disease, this tie to chronological age goes out the window. So what is not activity? Even our broad take on “activity” excludes things like Aromatherapy and Light Therapy. But these are both beneficial and can be “played in the background” so to speak. Put a full-spectrum light on the table while playing a game or working a puzzle, and get the light’s added benefit. Put some lavender oil in a diffuser while watching a calming video or listening to music to get ready for sleep. Listening to music can appear to be a passive activity, but that’s not necessarily the case. All kinds of activity accompanies this past-time. Most obvious is the toe tapping, finger-snapping, swaying in rhythm, and singing that so many of us enjoy, at least when we think no one is watching. Less conspicuous are a number of creative and cognitive acts that music inspires deep in our brains. The act of reminiscing is certainly one of these. In our context of dementia care the act of reminiscence is crucial, and music is one of our most effective tools to inspire memories. Play the music that the person in your care listened to when he or she was younger if you know what that is. Otherwise, choose music that was popular when that person was twenty to thirty-five years old. An eighty-five year old man would probably have the strongest emotional connection to music that was popular in the forties and early fifties. The big bands, jazz, male vocalists like Frank Sinatra and Nat King Cole, and the ladies like Dinah Shore and the Andrews Sisters dominated the music of this era, but it was not the only music. The music of the forties continued into the fifties, but that decade also ushered in a resurgence of American folk music and the birth of rock-and-roll. Music can become even more active when we start singing as a group, keeping time by slapping hands on the table or drums, if you have drums. If you are in a group, hand out tambourines, rattles, and anything else that can be used to provide percussive accompaniment and get everyone moving. 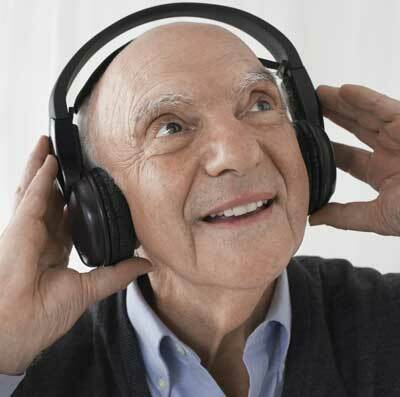 In fact, music can be one of the most beneficial activities for Alzheimer’s disease. Read more about music therapy. Enjoying music certainly ranks high on our list of activities for Alzheimer’s. Benjamin P. Sobel; Bingo vs. physical intervention in stimulating short-term cognition in Alzheimer’s disease patients. Am J Alzheimers Dis Other Demen 2001; 16; 115. Laura H.P. Eggermont and Erik J.A. Scherder; Physical activity and behaviour in dementia: A review of the literature and implications for psychosocial intervention in primary care.Dementia 2006; 5; 411. Rebecca Rosenberg. Experts prescribe children’s toys for Alzheimer’s patients. Columbia News Service. I love your products but the Bingo study baffles me. I find traditional Bingo is quickly too difficult for individuals living with dementia. They amount of visual tracking overwhelms them. I will have to access the study to better understand the stage specificity. Thought provoking, thank you. My husband’s Rotary Club run a “Memory Cafe” once a month for people with demenia, either in homes or being looked after in their own home. I would very much like you to email me all the relevant info on activities that we can provide for them. We have music, bingo, simple quizzes, memorabilia etc. and I have now bought a Colouring for Grown Ups book and some coloured pencils. Unfortunately I cannot get the info to print so if you could email me I can then print it off.